It's the only proper pub in Balham. Agree with earlydrinker (below) that this must be about the last pub in Youngs estate which they haven't yet wrecked. Lovely external appearance with quality brickwork and proper windows, and inside, although sadly all knocked through, the front area still feels like a proper public bar, like all Youngs pubs had 20-25 years ago. Beer prices very high, but then they have to fund all those bonuses and refurbs, don't they!? One of the better pubs I sampled in Southwest London on Monday night. This one had a little character and also had enough customers to create a reasonable atmosphere. In addition to Youngs Ordinary & Special & Wells Bombardier, they also had 2 guests - Sambrooks Wandle & Adnams Sole Star. As the previous reviewer states, they also have Meantime keg options. The beer garden is tree-lined and runs up the side of a narrow street. There were a fair few people out there enjoying a reasonably mild early Autumn evening. Worth a visit. OK, I'm a local of 2 years and this is my local so I'm a bit biased, but having tried all the others in the area, this is by far my favourite pub. George the manager has made some real in-roads over the the last year in putting in a new pump and providing a more diverse (and very welcome) selection of beers and ales - including Meantime on tap and in bottle. Alongside this, the food standard and variety has improved as well. Keep up the great work! It's still escaped Youngs' determination to ruin all their once great pubs, and turn them into soulless eateries. 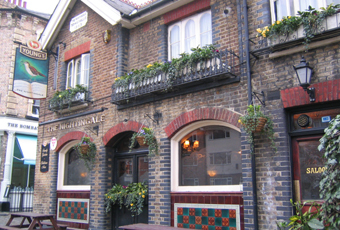 The Nightingale's still a real pub - and has been said before, a damn fine one too.